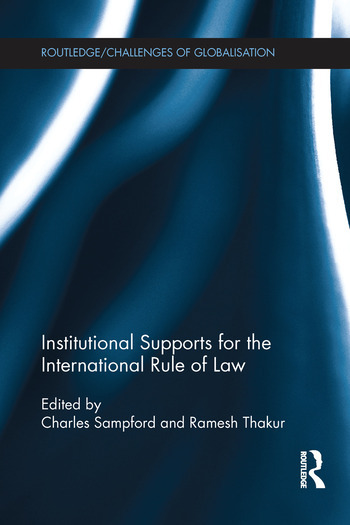 The rule of law is widely seen as the cornerstone of any effective polity and increasingly a vital component of the international political system. If the international rule of law were to be strengthened, it would greatly contribute to trade, security, human rights and global cooperation in a range of fields. Yet, in many areas the rule of law seems almost absent in international affairs. UN Department of Peacekeeping Operations. It will be of strong interest to students and scholars of international relations, international organisations, global governance, international law, migration law, international peace and security law, applied ethics, political economy, political science and sociology. Charles Sampford is the Director of the Institute for Ethics, Governance and Law,Griffith University, Australia, a joint initiative with the United Nations University, Griffith, QUT, ANU, Jindal Global University and the Center for Asian Integrity in Manila. Ramesh Thakur is the Director of the Centre for Nuclear Non-proliferation and Disarmament (CNND) in the Crawford School, Australian National University.